Choosing care products for quartz surfaces in your kitchen and bath areas may seem like a simple task. After all, quartz is known for its durability and ease of maintenance. It has even been featured in articles that report on consumer products. Yet, keeping your natural quartz counter top in the best condition possible shape does require some basic practices. One thing to be mindful of regarding your quartz surfaces is that it can stain if spills are not cleaned up relatively quickly. Because of this, it is wise to have a stone cleaner formulated for quartz on hand so you can respond quickly to any potentially harmful spills that may occur. 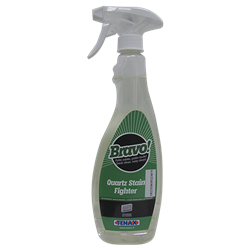 In addition to having a non abrasive cleaner on hand, regularly polishing your quartz surfaces can help them to resist liquids. By simply using our polish for quartz you will regularly maintain your quartz surfaces natural shine and luster while making the stone stain resistant in the process. Quartz is becoming more and more popular as a kitchen countertop surface material. If you have ever wondered about what it is made of and what type of special care is needed when you are caring for quartz, you will find this page interesting.